These leather coffee cup holders are our newest and totally superficial accessories. Therefore, completely essential! Keep your cup holder flat in your bag, order your beverage in your favorite coffeeshop. The cup holder is fully functional in 2 seconds, ready to hold your hot drink. Compatible with all standard coffee cups. Tired of having your name misspelled ? You can have your initiales stamped on the cup holder for free. Up to 6 letters – Silver color – Free of charge – Will be hot stamped on the front. 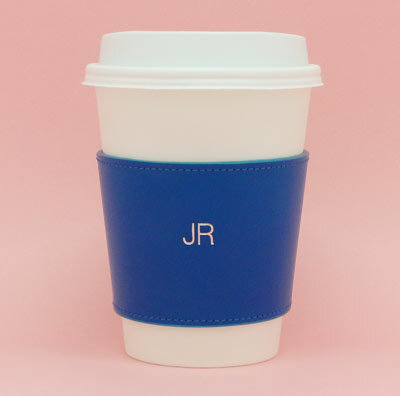 Personalize your leather coffee cup holder with your initials, free of charge. Will be hot stamped on the the front – Silver Color – Up to 6 letters.